Run, walk, sleep, repeat - your health routine can be tracked and monitored with ease, as you wear the Honor Band 3 smart band on your wrist. It has a water-resistance level of up to 50 meters, so you can even go for a swim with it. What's more? You can also keep a track of your notifications, sleep patterns, and heartbeat. 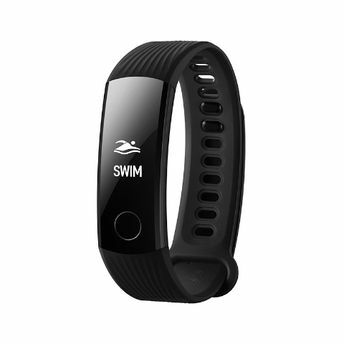 With a water-resistance level of up to 50 meters, this smart band will be the perfect companion to tag along for a swim since it includes custom swimming mode tracks and shows the number of calories burned, the time taken, and other important information. It comes with the Optical Heart Rate Monitoring Technology that lets you check your pulse rate at any time with the flick of your wrist.You can also opt for the 24-hour heart rate tracking or choose from the different heart rate zones to optimize your workout sessions. Not only this it also comprehensively tracks light, deep, and REM sleeps, as well as wake-ups in the middle of sleep, to provide analysis and recommendations - including for naps. Note: This smart band can be paired with smartphones that have Android 4.4 or later and devices with iOS 8.0 and later.